The celestial equator is inclined by 23.5° to the ecliptic plane. The image shows the relations between Earth's axial tilt (or obliquity), rotation axis and plane of orbit. The celestial equator is a term in observational astronomy. It is a great circle on the imaginary celestial sphere, in the same plane as the Earth's equator. In other words, it is a projection of the terrestrial equator out into space. 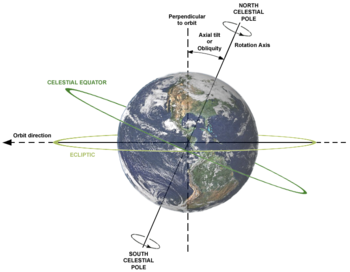 As a result of the Earth's axial tilt, the celestial equator is inclined by 23.4° with respect to the ecliptic plane. An observer standing on the Earth's equator visualizes the celestial equator as a semicircle passing directly overhead through the zenith. As the observer moves north (or south), the celestial equator tilts towards the southern (or northern) horizon. At the poles, the celestial equator is parallel to the horizon. The observer always sees the ends of the semicircle disappear over the horizon exactly due east and due west, regardless of the observer's position on Earth. This page was last changed on 9 April 2013, at 07:50.